We are big advocates of what we’ve dubbed ‘crazy paving careers’. Like crazy paving, these are careers that do not follow a structured linear pattern. Instead, we encourage our colleagues to think sideways as well as upwards, moving between different areas, departments and businesses to broaden their experience and skills. 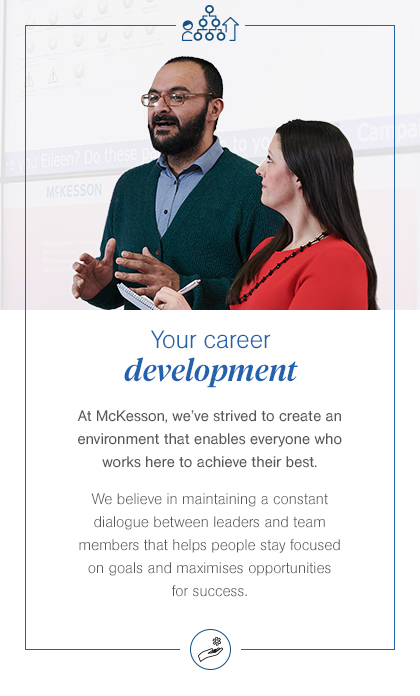 To ensure everyone gets the most out of their McKesson careers, we always set clear goals, give meaningful feedback, and provide dedicated 1:1 time and coaching throughout the year. You’ll also have formal reviews at the midpoint and end of each year, where you’ll be able to discuss your performance with your manager, examining not just what you’ve achieved but also how you’ve achieved it. We try to give our colleagues as many opportunities as possible to learn about our business, develop their skills, expand their knowledge, get up-to-the-minute training, and become an expert in their chosen field. One great way to learn is through our online platform, mylearn, which puts a library of over 1,000 expert articles and e-learning modules right at your fingertips. We have a large pool of senior leaders who provide mentoring to colleagues throughout the business. It’s an excellent option for anyone who wants a different perspective on their career development, and who thinks they might benefit from the insight and advice of more experienced colleague.